Digital invoicing has its quirks like every other form of digital transaction. Sometimes we may send an invoice to the wrong recipient through pressing the wrong buttons on our keyboards and thus the wrong e-mail address gets entered. Alternatively, we may enter the wrong VAT (or sales tax if you are in the U.S.) rate or itemize our services incorrectly. This can be a huge hassle and problem for companies processing lots of invoices annually. What can be quite troubling is if invoice payment data is entered incorrectly or multiple invoices are paid for instead of one. Wit is in the fine details that companies can pay heavy prices financially. Maritime-Executive has a recent story available on how often duplicate invoicing occurs due to payees pressing the payment button more than once. Sending wrong payment information and duplicate invoices are just some of the things we have to watch out for when sending or signing invoices digitally. Forbes’ John Rampton has written an interesting article on other hurdles to keep an eye out for regarding invoicing as a whole (particularly eInvoicing). His article, titled 25 Invoicing Mistakes to Avoid in Your Small Business, gives tips to avoid that people often make when invoicing such as not following up with unpaid invoices, having unclear terms on invoices, not having a contract signed before the invoice is sent, sending invoices to the wrong departments or persons, failing to itemize and more. All of these things can particularly be a problem with eInvoices as it is often time consuming to itemize everything during a given period and easier to just list everything under one service or even product. Having terms also may be a bit difficult with people or companies working across geographic and cultural barriers of payment forms, payment dates, service delivery dates and other details. However, in this digital world and international work environment, we need to familiarize ourselves with the process and keep practicing. It will then become a second nature to invoice anyone around the world with eInvoicing solutions. Despite these woes, do not panic. Electronic invoicing, or eInvoicing, still saves companies across any industry a lot of funds and headaches. Overall, the transformation to eInvoicing is a great one and needed for environmental, hassle-free and cost-saving reasons. SaaS systems allow companies to instantaneously send invoices across any device or browser. However, as the article above mentioned, there are things that can cause companies problems and quirks that need to be ironed out and duplicate invoice sending is certainly a problem in some cases. It is easy to send invoices via Paypal using Paypal’s free invoice templates, however keeping track of them and having payment options outside of Paypal is beneficial in the long run for companies to consider. This is also why using a good invoice SaaS-based system, such as InvoiceOcean or Freshbooks, will benefit companies of any size, particularly ones processing large amounts of invoices. InvoiceOcean’s system, for instance, shows if an invoice was issued or not from the dashboard visible across any browser or device. Thus, it is not sent automatically to a recipient’s e-mail address, but the issuer has to go to a panel and send it. Users also have to mark it paid and there is a clear system in place for receiving payment. In fact, InvoiceOcean’s system is set up where one cannot simply number an invoice the same number twice. One can go to settings and even set up invoice numbering from the menu to make the process seamless. The company also has various departments available that users can add, as well as individual companies if they are part of the Pro or Enterprise plans, with a separate invoicing number system if needed. If you do make such a mistake on your invoice, such as sending it twice or with the wrong item amount or even wrong payment information, you can send an invoice correction (called correction note) and link it to the original invoice you’ve sent out. Having a robust and feature-rich invoicing solution is beneficial for businesses and enterprises of any size and across any industry. Mistakes often get made and having a system such as ours that can help mitigate the hassles and quickly rectify the errors helps. A system that has great tracking capabilities, reminders or signals of invoices paid vs not paid and ways to correct invoice mistakes. That is what makes InvoiceOcean truly stand apart in the eInvoicing realm of today. 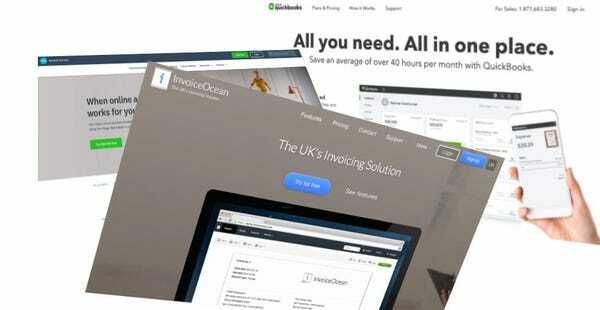 Besides InvoiceOcean (UK branch, US branch), which is a relatively unknown startup from Europe, other solutions out there are the aforementioned Freshbooks, Xero, InvoiceNinja, Intuit Quickbooks, Invoicely and many others. The competition is fierce and each system has its quirks. For instance, Freshbooks has a great and easy credit card and online payment system (including ACH transfers using WePay) set up directly once invoices are issued from an e-mail and is integrated without added API copy and pasting needed as InvoiceOcean requires at the moment (for Paypal integration at least). Some also have less robust features and options but a very simple interface to use, such as Invoicely and Freshbooks. Each has its strengths and weaknesses and it is always good to have options both in payment processes and ways to send digital invoices to clients. It is worth trying out the various systems and finding out which you will suit your company’s or individual needs. The world is going toward eInvoicing as it frees up paper shelf space for storage, helps the environment, makes everything more seamless and more hassle-free with less trips in hand with paper between companies and tax offices and is the way of the future with SaaS and other solutions available. In fact, the European union aims to be paper free in terms of invoicing in the public sector by 2020. However, there are many hurdles to overcome before this becomes a reality worldwide and many industries that refuse and will refuse for a long time to let go of that paper. In America, paper invoicing may have even a stronger grasp than that of Europe. According to BAI, both U.S. And Europe process around 25 billion invoices annually and 75% of them are done traditionally using paper invoicing. However, while Europe is adopting heavy eInvoicing standards and putting pressures on companies to go paperless, the U.S. is much slower in this regard. There are many industries where it may make sense to always rely on some sort of paper invoicing vs sending itemized invoices online. Some companies work directly with each other physically and need a physical signature for instance, rather than an eSignature, and it is easier when two managers are face to face to sign a paper invoice. However, for many industries and in much of the world, eInvoicing is the way to go and it is worth trying out a good invoice system for companies of any size, freelancers and entrepreneurs making their mark on the business world.